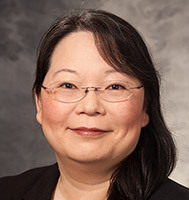 Dr. Peggy Kim is a faculty member of the University of Wisconsin's Department of Anesthesiology. She provides chronic pain medicine services as a part of the cancer pain management program and Interventional Pain Management Program. She also performs interventional procedures at the Madison Surgery Center. Dr. Kim is passionate about helping patients with pain related to cancer and cancer treatment. She believes in a patient-centered, evidence-based, interdisciplinary approach to pain, using minimally-invasive treatments and technologies when appropriate and integrating care from other treatment modalities and specialists to provide an individualized, comprehensive care plan. In addition to her clinical work as a pain physician, Dr. Kim conducts research involving outcomes in cancer pain and the education of medical students and residents. She is also an advisory member of the Young Physician's Council of the Cancer Pain Research Consortium and a member of the American Society of Anesthesiologists and the Society for Education in Anesthesia.